Cordon Real Estate is a full service real estate brokerage serving the Bay Area’s Wine Country, East Bay and Silicon Valley communities. We provide sales and property management services and specialize in fine homes, estates, land and residential investment properties. Our clients are buyers, sellers, investors and estates held in probate or trust. Here are the advantages of working with Cordon Real Estate. We have a flexible process that combines a broad range of services found in larger firms with custom solutions that meet your specific needs. We are tough negotiators. We start with thorough preparation, then employ creative and effective strategies to achieve the best possible terms of sale, whether buying or selling. We have experience with many types of residential properties: condos, homes, apartment buildings and land parcels. We have experience with many types of transactions: standard, probate and trust. We’ve helped buy, sell or manage real estate throughout the Bay Area, from Pebble Beach to Vacaville. Our primary service area covers most of the region (see list of counties below). We represent only one side in each transaction, focusing our effort and skills solely on you (click for more about: dual agency). As a small, independent brokerage we have lower overhead expenses and pass the savings to you with competitive fees and commissions. John Souerbry, Broker/Owner of Cordon Real Estate, entered the industry in 2003 when he signed on with a large real estate office in San Diego, California. John originally focused on mortgage lending, but by 2005 began dealing in residential and investment properties. 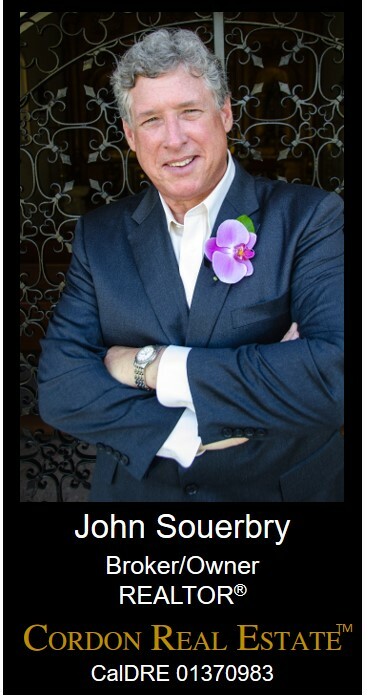 Within a couple years he formed John A. Souerbry & Associates, providing brokerage and property management services. John relocated to the San Francisco Bay Area in 2007, where he continued to provide real estate services to buyers, sellers, investors, estates in probate and trusts. The business soon expanded its service area to include not only Silicon Valley, but also the East Bay and Wine Country. The name change to Cordon Real Estate took place in January 2016. 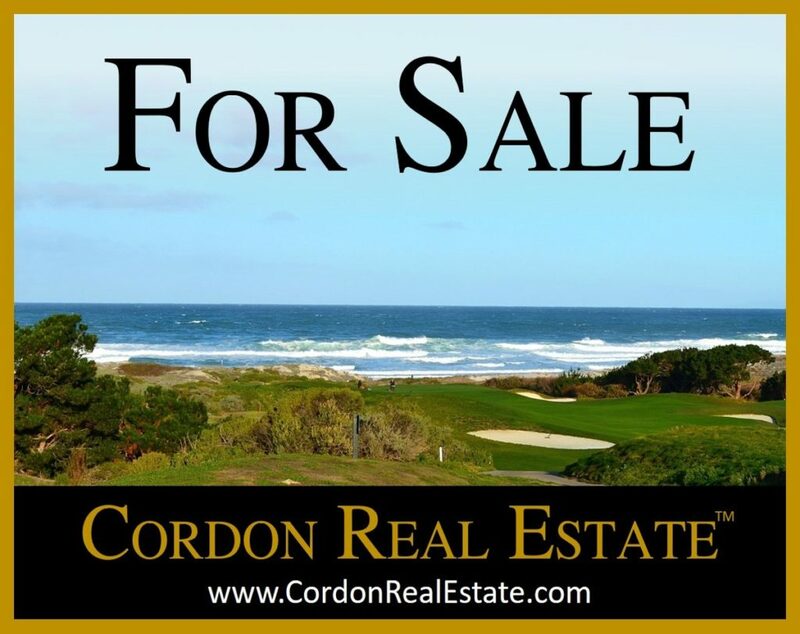 Our first custom For Sale sign (below) was hung in front of a Pebble Beach, California townhome that enjoys this view of the Pacific Ocean and Hole 14 at the Links At Spanish Bay golf course (Sold for $3.65M, escrow closed March 30, 2016). John is active in the community, serving as a volunteer member of the Solano County Sheriff’s Search and Rescue Team and a trustee of the Bay East Association Of REALTORS® Foundation, a non-profit that awards scholarships to local college-bound students. John also writes a wine blog – Wine Adventure Journal – which chronicles Adventures In The World Of Wine And Adjacent Amusements.